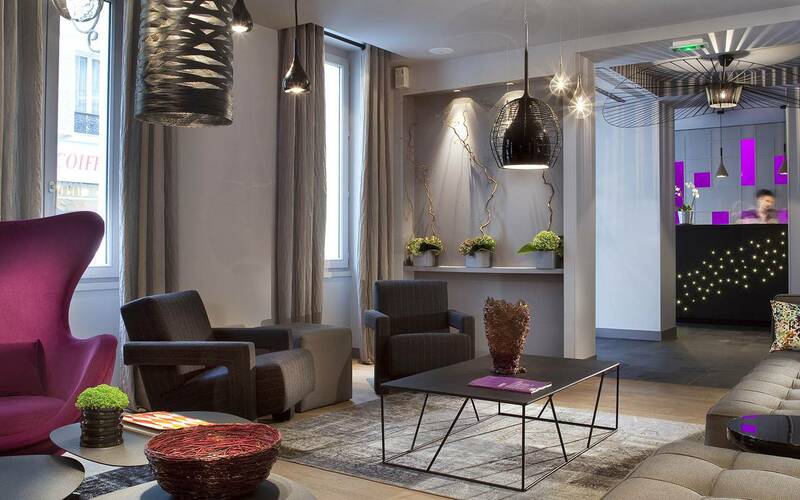 Le Grey Hotel welcomes guests in a refined and intimate atmosphere, where every detail has been thought to give them the best service and make their stay more enjoyable. Our Reception and Concierge Team, multilingual, is at the disposal of our guests 24/24 to meet all their demands. A dinner, a visit to organize? A romantic getaway in a 2CV with driver or just a ride with private driver in the heart of Paris? Book your tickets to museums, shows and attractions and enjoy our good addresses, they are deemed, secret or trends! Our team available and attentive, will make your stay special. It offers a wide selection of fresh and quality products: pastries and breads from the Maison Landemaine , toast, cereals, fruit juices, hot drinks (Nespresso coffee, Kusmi tea, chocolate, milk), cheeses, delicatessen, fresh fruit salad, dried fruits, yogurt, scrambled eggs, bacon and sausages,… Gluten free breakfast upon request (prior to arrival). Possibility of breakfast in room at a charge of € 4 per person. It offers a selection of pastries and breads from the Maison Landemaine, toast, fruit juices and hot drinks (Nespresso coffee, Kusmi tea, chocolate, milk). From 11 am to 11 pm, our lounge bar offers a cozy atmosphere for your business appointments, to work quietly or just relax with a drink. A selection of aperitifs, French wines, champagne and soft drinks is available. 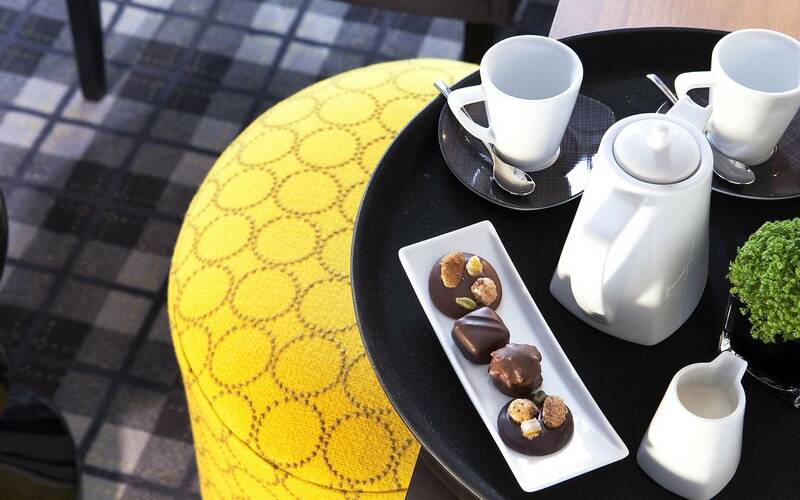 Tea Time: From 3 pm to 6 pm, Kusmi tea and Nespresso coffee as well as some sweets are freely available in the hotel lobby. Room service is available from 12:00 to 22:30. Le Grey Hôtel gives you access to the Resto in premium delivery service, guaranteeing a refined selection of the best restaurants. Our team of Reception / Concierge, continually informed of cultural, artistic, gastronomic and major events in Paris, is at your disposal 24/24 to make your stay as pleasant as possible, with personalized service. A special occasion? An event to celebrate? A person to charm? We are here to help if you wish to put champagne, flowers, macaroons, chocolates or any other small presents in your room! The entire property has free Wi-Fi (rooms and public areas). At your disposal: a business corner in the lobby with printer, Ipad on request, loan of adapters to charge your devices and a copies and fax service at the reception. Children and babies are welcome at Le Grey Hotel. For families, we have Executive rooms (2 adults and 1 baby under 2 years), Double or Twin connecting rooms (2 adults and 2 children), Deluxe triple rooms (2 adults and 1 child under 12 years) or our Suite with a sitting area (2 adults and 2 children). Upon request we provide you with a cot, a changing mat, a high chair, a stroller and a bottle warmer. Babysitting on request (extra fees): we can organize the custody of your children in partnership with an approved company of experienced babysitters. A secured storage room is available to drop your luggage at arrival or upon departure. A laundry / dry cleaning service is available. Within 12 to 24 hours is required according to the filing time. All common spaces as well as a Grey Superior Double are accessible to people with restricted mobility.